The manager of a McDonald’s in New York City’s Bronx borough decided to double his earnings by dealing cocaine while managing the fast-food restaurant, according to prosecutors. Frank Guerrero, 26, worked at the 24-hour McDonald’s location on Bruckner Boulevard for about eight years, and during that time, he often unlocked the doors to serve up cocaine alongside the meals, prosecutors charged, according to the New York Daily News. Someone tipped off the cops and federal authorities about the scheme, and the authorities organized a bust and ordered up to eight supersized drug buys “in increasingly larger quantities” before taking Guerrero into custody Wednesday morning, officials said. According to the authorities, Guerrero hid the cocaine on a soap dispenser in the restaurant’s bathroom before his shift began and then started dealing the crack and cocaine as he sold burgers, right under the noses of other employees. 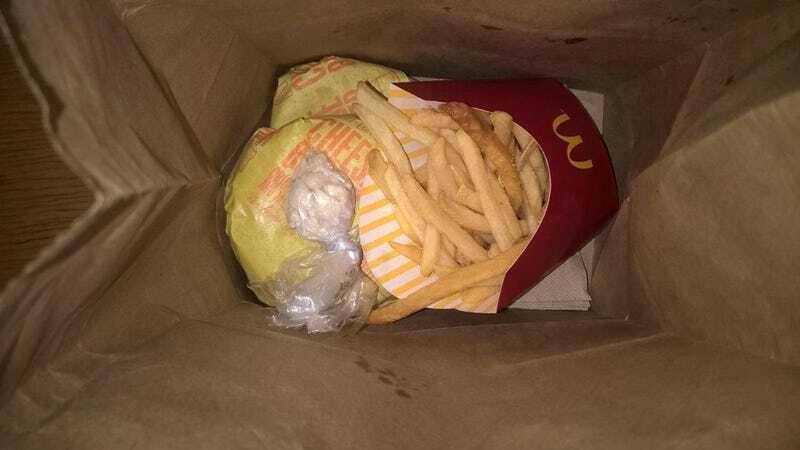 He sold drugs to an undercover officer at the counter twice, stuffing the drugs into a cookie bag, along with two cheeseburgers, a soda and fries, prosecutors say. In total, Guerrero sold the undercover cop almost $10,900 in drugs. When officers finally raided his home, they found some 200 grams of cocaine and $5,300 in cash, authorities said. Guerrero had apparently hidden the drug money in a dresser in his 2-year-old son’s playroom. Guerrero’s girlfriend, Leidy Cabral Castillo, was also arrested in the bust, officials said. Read more at the New York Daily News.